On the list of often overlooked, but vitally important muscles, are those of the upper back. Why? Because it’s easy to skimp on them in favor of toning the more impressive muscles, like your legs or arms. But just because you can’t easily see the muscles doesn’t mean you should pass on upper back workouts. According to Amanda Dale, ACE-certified trainer and sports nutritionist, strong upper back muscles set your body up for success by helping with increased mobility in sports, regular exercise, and daily life. A strong upper back is also critical for good posture, adds Elanit Friedman, Openfit’s director of fitness and wellness. “We tend to sit slouched over in front of a computer all day, or staring down at our phones,” she says. This hunched posture can lead to shoulder and neck stiffness or soreness, as well as more intense back pain. That’s why it’s key to adopt a consistent upper back workout routine to reduce your risk of back injury, improve your mobility, and boost your overall strength. Here are 10 of the best upper back exercises to get you started. Benefits: “This move works your upper back muscles, as well as your shoulders and core,” Friedman says. Holding a dumbbell in each hand, start in a high plank position with your wrists under your shoulders and your head, hips, and heels in a straight line. Pull your right hand to your ribcage then fully extend it to the sky as you twist to the right side. Make sure your arm extends directly over your shoulder and not behind you. Return to the high plank position then repeat on the other side. Continue alternating, doing equal reps on both sides. Benefits: This move targets your rhomboids, lats, and erector spinae, while also working your core, Dale explains. Stand holding two dumbbells at your sides and take a big step forward with your left leg, bending it to assume a deep lunge position, keeping your right leg straight. Bend forward at your hip, attempting to lay your torso on top of your left thigh. Let your arms hang on either side of your left leg, palms facing each other. 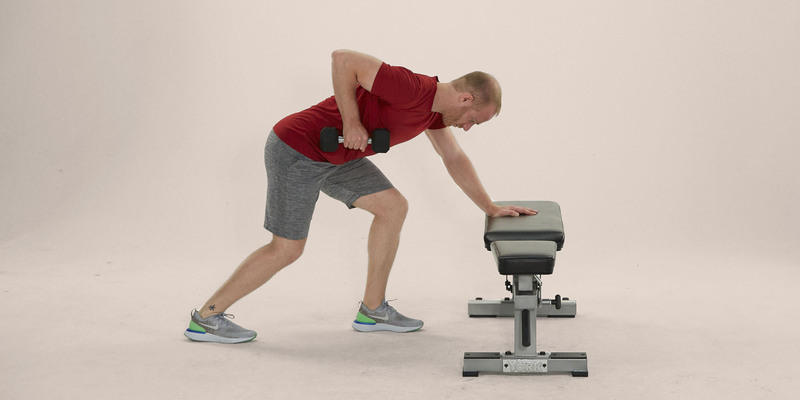 Keeping your back straight and your abs contracted, bring the dumbbells to the outside of your ribs while keeping your elbow close to your side. Slowly release back down and repeat. Stand with your feet hip-width apart on the center of a resistance band. Wrap one end around each foot and cross the handles. Bend your knees slightly and lean your chest forward slightly, keeping your back straight. Keep your core engaged and your back straight as you pull your hands up to your rib cage, squeezing your shoulder blades together at the top. Release your arms and repeat. Benefits: The wide bent-over row is an excellent way to target your lats, while also hittting your delts and your core, Friedman says. Holding a set of dumbbells, stand with your feet hip-width apart and a slight bend in your knees. Bend at the hips and lean your chest forward until it’s parallel with the ground, keeping your back straight and your core engaged. Let your arms hang down with your palms facing your shins. Drive your elbows up and out, forming a goal post with your arms and squeezing your shoulder blades together as you pull back. Release your arms down and repeat. Benefits: This move is a total-body exercise — not only does it engage your traps, rhomboids, and rear delts, it works your core and leg muscles, too. Stand holding two dumbbells at your sides. Take a big step forward with your left leg, bending it to assume a deep lunge position, keeping your right leg straight. Bend forward at your hip, attempting to lay your torso on top of your left thigh. Let your arms hang straight down to the sides of your left leg, palms facing each other. Release your arms down as you drive your right knee up toward your chest for a crunch. Place your left back into the lunge position and repeat. Do equal reps on both sides. Benefits: By working one arm at a time, this move helps identify muscle imbalances you may have in your upper back and eliminate dominant-side compensation, Dale says. Holding a dumbbell in your right hand, place your other hand on a bench or stability ball in front of you. Step your right leg back keeping it straight, and bend your left leg slightly. Lean your chest forward, keeping your back flat. Drive your elbow up, bringing the dumbbell to your ribcage. Release your arm down and repeat. Benefits: “This move is incredible for developing the smaller muscles of the upper back, as well as improving overall posture,” says Dale. Benefits: The vaulter pull-up is a killer way to challenge multiple areas of your upper body, including your back, shoulders and biceps, Friedman explains. Grip a pull-up bar with one hand facing forward and one hand facing backward. Pull yourself upward until your chin clears the bar, keeping your back straight and core tight as you pull yourself up. Lower yourself until your arms straight, and repeat. Too tough? Use a pull-up assist band to make it easier. Benefits: This move targets your middle and upper back muscles, while also relying on strength from your biceps, Friedman says. The real challenge? Separating your legs keeps your core engaged the entire time. Take an underhand grip on a pull-up bar. Keeping your legs stretched wide in an upside down “V” position, pull yourself upward until your chin clears the bar, keeping your back straight and core tight as you pull yourself up. Benefits: This move is a great way to work your lats, while also strengthening your shoulders and core, Friedman explains. “It’s great for beginners because it teaches your core to stabilize upper body movement,” Dale adds. Holding a set of dumbbells, lay with your back flat on a bench or stability ball. How do you strengthen your upper back? When it comes to building and toning your upper back, it helps to know the exact areas you’re targeting. Here’s a brief overview of the back muscles. The major muscles of the upper back are the trapezius (a kite-shaped muscle that runs vertically along your upper spine and fans out toward your shoulders), the rhomboids (the diamond-shaped muscles that activate the shoulder blades), the latissimus dorsi (the fan-shaped muscle originating at your mid and lower back and attaching to your upper arms), and the erector spinae (which run down the entirety of the spinal column from the neck to the lower back), Dale explains. Together, these muscles allow you to lift, press, row, and pull during your workouts and daily activities, like sitting at your desk and carrying heavy grocery bags. For a stronger, more defined back, Dale recommends working these structural upper back muscles at least twice a week, and more often if you struggle with chronic lumbar pain or scoliosis. “The important thing to remember is that the upper back is already a place where most people hold tension — especially those who sit at a desk — so you’ll want to keep your weights light to moderate when you exercise,” Dale says. How do you stretch your upper back and neck? Combat tight upper back muscles by stretching them after each workout, and even on days when you don’t work out. To do this, Dale recommends rolling your neck slowly from side to side, then moving into a cat-cow pose to warm up your upper back. “After a workout, an outstretched child’s pose can stretch the upper back and shoulders while allowing the neck to release,” she explains. Foam rolling is another way to target your upper back muscles, and you can check out these additional nine shoulder and neck stretches. After you sweat it out, it’s important to fuel your body with enough protein to help your muscles grow and recover. As a general rule, Dale recommends consuming at least half gram of protein per pound of bodyweight.